If you haven't seen this movie in a while, then it is worth re-visiting, as I did last night. In the wake of larger productions such as Steven Spielberg's "Schindler's List", as well as some of the more recent film documentaries about the Holocaust in general, which are all magnificent works in their own right, it is refreshing to see a film as simply made as this one. A film that explores the plight of one family, and their guests, in a hidden attic apartment, simply trying to survive. There is no overview of the Nazi Holocaust, it serves merely as the backdrop against which this group of human beings is forced to struggle. Rather than detract from, this approach actaully adds a singularly human element to the film. It's easy to get lost in the history of the Nazi's, focusing on the atrocities. But sometimes it can be more telling to step back and look at the effect on one family in order to gain a wider understanding of just what it meant to be hunted and persecuted like animals. The horrors of the conentration camps are so cruel and terrible, that viewing them can seem almost abstract, when compared to the more easily imagined discomfort of being shut away from all that you have known. The small, cramped attic apartment can be even more daunting, in some respects, than the open areas of a concentration camp. In the camps, you were already discovered, and rid of that fear. Your fate was sealed. In the attic, there was still hope, but with that hope came the constant, unrelenting fear of discovery. And that way of living can take it's own toll as well. The tiered construction of the set, comprising the 3 floors of the building in which the Frank family lived, gives the viewer a good idea of just how close the family was to discovery with each passing day. Confined to bed during the daylight hours, with no talking allowed, the only view of the sky through a skylight, wondering if that police siren is coming to you, these were the circumstances under which the family lived and Anne Frank wrote her diary. 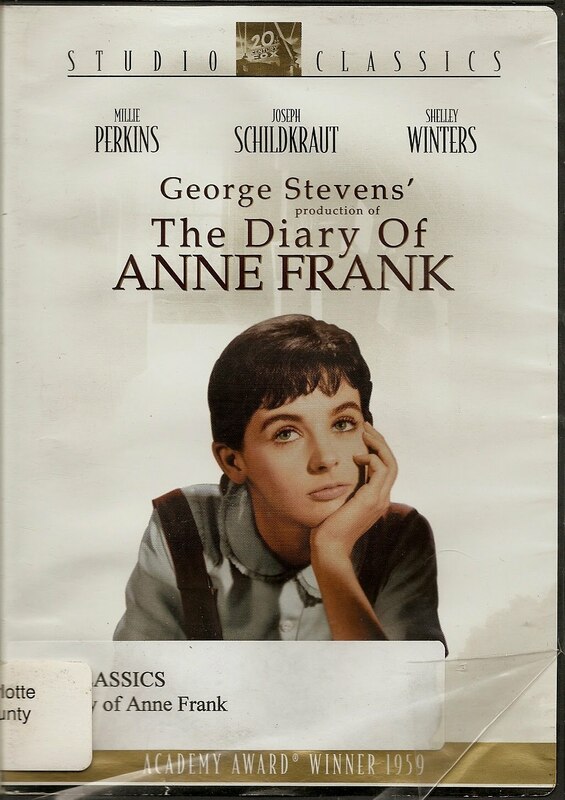 Millie Perkins is wonderful as the young Anne Frank, stumbling through her early teenage years hidden away in the attic. Joseph Schildkraut, arguably one of the best actors of all time, is gentle and nuturing as her father. He is the leader of this band of hidden refugees. His words are always measured, his decisions always clearly thought through. He is a responsible and very well liked man. Shelley Winters is in fine form in this film, playing Petronella Van Daan, the wife of Peter Van Daan, played by Richard Beymer to perfection. They are the couple who have come to stay with the Frank family. She is a woman who is frustrated and angry, someone who wishes that she could just go back and do it over. It is clear that she does not love her husband. He, on the other hand, is a man who feels beaten and betrayed by everything, including his wife. Ed Wynn is his usual mixture of comedy and pathos, playing the role of Albert Dussell, a non observant Jew who is thrust upon the family in the middle of the film, at a time when the Jews were being snatched off the streets and taken away for the "Final Solution." He is crass and angry, with a feigned allergy to the cat that lives in the attic with the family. Frances Goodrich wrote the play, as well as the script for the movie, using the Diary of Anne Frank. If you have ever read the book, then you have marveled at how this 14 year old girl was able to capture all of the nuances involved in living in such close quarters, both with the people she loved, as well as perfect strangers. Where did such insights come from? When the Nazi's do finally come in, it is with all the force and brutality that one expects. And in the end, all that is left is Anne's diary. That little book will stand on it's own merit for eternity. In it are the hopes and dreams of not just one young girl, but of all humanity, calling out collectively for dignity, freedom and justice. Is that too much to ask for?